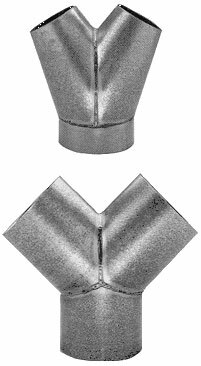 K&B "Y" fittings are designed to join branches to the main at an angle of 30° or 45°. Made in all sizes from 4" though 48" diameter in black or galvanized steel. Gauges range from 20 through 10, depending upon requirements. Fittings from 3/16" and heavier material can also be fabricated. Larger diameters are also available. Kirk & Blum, Division of CECO Environmental, 3120 Forrer Street, Cincinnati, OH 45209. Tel: 513-458-2600; Fax: 513-351-5475.